Heimdallr is the watchman of the Gods, who guards the rainbow bridge Bifröst and is fated to announce the coming of Ragnarök, at which point he and Loki will die fighting one another. He is a consummate warrior, possesses the ability to see events all across the nine worlds, and is credited with creating the human social classes. He is attested in the Poetic Edda, Prose Edda, Snorri’s Heimskringla, the poem fragment Heimdalargaldr, in skaldic poetry, and on an Old Norse runic inscription found in England. Heimdallr is described as the “whitest of the gods” and also as having gold teeth. His hall is Himinbjörg, or “Heaven Mountain,” in Ásgard, and he famously touts Gjallarhorn, a resounding horn which can be heard throughout all the worlds. Though he seems to have no partner within the pantheon, and no heavenly sons or daughters, Heimdallr does father many children amongst humankind under the name Rigr. The references to Heimdallr throughout the lore are often obscure, and translations vary so widely in interpretation that there are great differences in theories about the god. Some of the most interesting concern his role at Ragnarök, his input in the creation of mankind, and the possibility that he may actually be a personification of the world tree Yggdrasil. Though it is usually agreed that Heimdallr carries the great Gjallarhorn, and will blow it to announce the onset of the end of the world, an alternate interpretation of a key stanza in Grímnismál changes “horn of Heimdallr” into “Heimdallr’s hearing.” Supported by clues in other areas of the Edda, this would mean that rather than a giant horn, the author is describing how Heimdallr left his ear at the well of wisdom, similar to how Óðin left his eye. In this way, Heimdallr announces the coming of Ragnarök as a prophecy. Other similarities to Óðin (such as references to humankind as “Heimdallr’s sons” and possessing foreknowledge of crucial events) may suggest that Heimdallr was imported from an adjacent culture and absorbed in the same way that Týr and Ullr may have been. Heimdallr is the son of nine mothers, though there is discussion over who exactly these nine women were, or if they were even women at all (they may have been ocean waves!) and we are not certain to which tribe of gods he sprang from. All in all, he is one of the most mysterious and confusing of the gods, and we simply do not know enough about him – even to determine if this was intentional by the writers or not. Despite being one of the harder to pin down gods, Heimdallr is still one of the more popular of the Æsir for modern Heathens. He has many positive associations and continues to inspire lively speculation and debate. A few of the gods are regularly referred to as “bright” or “light” and we assume this means glorious and heavenly … rather like most of the world’s perception of what angels must be like to behold. Heimdallr, however, is the only god specifically described as “white” and this perplexes most scholars. Personally, I find it very exciting. It’s a clue, I think. On one hand, it points out the ancestry of Northern Tradition’s origins – the Germanic and Scandinavian peoples. On the other hand, if it’s important to point out that one god is definitely “white,” then it stands to reason that the rest of his companion gods were probably a mix of other colours. It’s as good an argument as any for the Norse pantheon (and thus its people) to be a multi-cultural mix. Stuff that down your shorts, racists. Heimdallr’s mothers may have been nine giantesses, or nine goddesses. Ægir, jötunn god of the sea, had nine daughters. 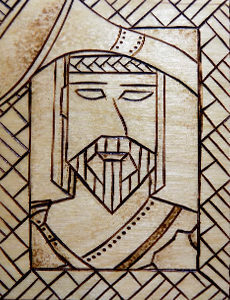 So did Njörðr, the Ásgardian god of the sea. Some translators think that Heimdallr’s nine mothers were nine ocean waves – which could still be either of the sea gods’ daughters, too. However, the theory that Heimdallr is in fact somehow a personification of the world tree, Yggdrasil, is also supported by the nine mothers, if each of the nine are one of the nine worlds which make up the tree. There are also vague theories concerning his association with rams and roosters, and the possibility that he may be a Vanir. Regardless of the truth within any of the existing theories, Heimdallr is most definitely on par with Óðin for power. Even if he gave his ear to Mímir for wisdom, he can see throughout the nine realms without the aid of Óðin’s lookout tower, he knows the runes, he may have had a hand in the creation of humankind, and he takes down Loki at the end of the world. Gjallerhorn, loud horns, sirens, and alarms. Roosters and rams. Rainbows and bridges. Waves. Heimdalr, Heimdali, and Heimdall. Rig/Rigr, Hallinskiði, Hama, Gullintanni, Vindlér, and Vindhlér.